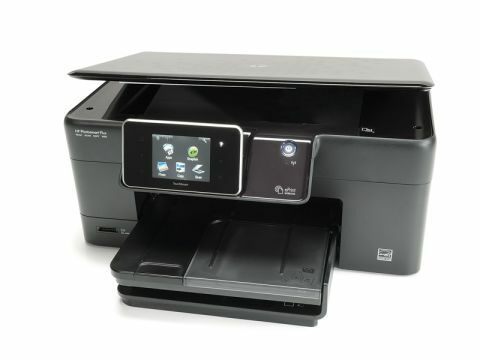 Most all-in-one printers concern themselves with four main areas: printing, scanning, faxing and photocopying. The HP Photosmart Plus B210a adds web apps to this list. While almost every all-in-one can connect to your home network, this one supports third-party apps, giving you even more options for what to do with your photos. For example, the Snapfish icon lets you upload photos you've scanned to the Snapfish website, where you can edit and share them. You can also use Snapfish to transform photos into canvases, photo books, calendars and more. Other apps let you find and print articles from the internet without turning on your PC, and print out calendars, notepaper and even games. A press of the touchscreen gives you a sheet of Sudoku puzzles, for example. All the apps and other functions can be accessed via the touchscreen on the front of the printer. The screen lacks responsiveness, and we often had to jab at it a number of times before the printer recognised what we wanted. Print quality is fantastic, with vibrant colours doing justice to photos on normal and glossy photo paper. It's also quiet, which is a relief after the noisy work of the Kodak ESP 7250. Scanning and copying are also quick, and the results are excellent. These tasks can be initiated from either the PC or the touchscreen. When scanning, you can choose to scan to a PC or to a memory card. If you choose to scan to your PC, you can also choose what to do with the scanned image afterwards. For example, choosing 'Photo to email' will scan the photo, open your email client and create a new message with the image attached. Little features like this might not revolutionise the way we work, but make all-in-one printers quicker and easier to use.